Management consultant and Christian life coach Jeff Spadafora provides a blueprint for building a life of greater joy and delivers a plan for frustrated believers to become joyful followers. An increasing number of adult American Christians are frustrated. Even as they read their Bibles, listen to sermons, and hang out with other Christians, they become painfully aware that something is missing: joy. As a result, many have given up on their faith being a source of joy, and instead they seek meaning, purpose, and joy through their work, relationships, hobbies, possessions, or even more destructive and hollow substitutes. 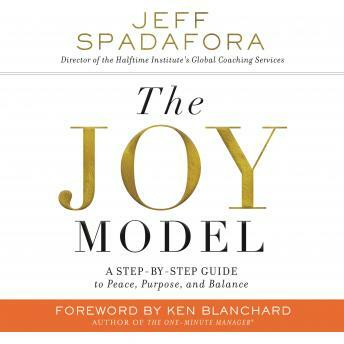 In The Joy Model, Jeff Spadafora offers a better way, showing readers that joy comes from balancing the practical and spiritual sides of our lives—from the “Doing” and the “Being” of the Christian life. On the spiritual side, he reveals tried and true disciplines that move readers from knowing about God to actually experiencing him. On the practical side, he shows how to transform relationships, attitudes, finances, and work in ways that result in significant increases in joy. Weaving together his own spiritual journey, stories from his experience coaching others, and down-to-earth principles and practices, Spadafora helps readers find the joy in a life that is more vibrant and real than any they have experienced before.